Beautiful Knotty Pine Cabin with a Great floor plan and fantastic views! Drive up to off-street parking with plenty of flat area for storage or utility room. Perfect amount of Privacy to enjoy your space and entertain/bbq on the deck and take in the mountain air! 1 Lower level Master Bedroom, 2 loft rooms- potentially the 2nd room upstairs can be used as a 3rd bedroom, indoor laundry hook-ups, tons of storage! Enjoy the fireplace in the cozy living room with views of the trees and high ceilings, and you will Love this location. 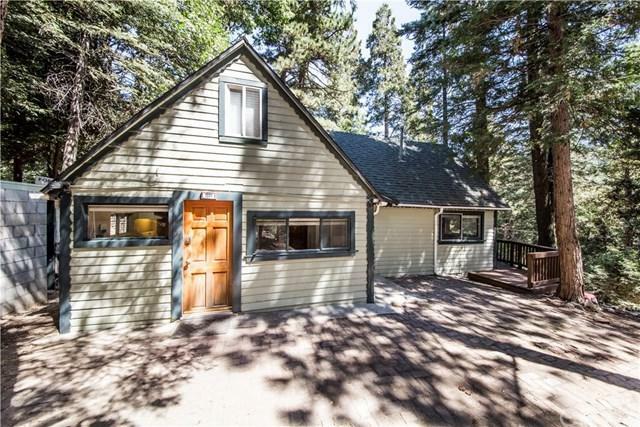 Centrally located between Lake Arrowhead & Lake Gregory, and within close proximity to great restaurants such as Hortencias Cliffhanger restaurant and tons of shops in the downtown area!